1st. day - Meeting point: parking lot at highway exit ROVERETO SUD Trentino at 09.00 a.m. - Rock climbing lesson in suitable climbing crag; we teach different climbing techniques for example: chimney, cracks, slabs; different knots, belaying, rope carabinr set techniques, abseiling. The experience of this day is very important for the performance of our course. 2nd. day - Departure from the hotel at 08.30 a.m. - Via ferrata "Colodri" Arco (easy) and other "Rio Sallagoni" (difficult) to Castel Drena, two short routes short but significant for the didactics: a short and easy route for warming up and exercising the use of the set and afterwards a difficult trip to improve your technique. The total duration of the day is about six hours. 3rd. day - Departure from the hotel at 08.30 a.m. - Climbing on via ferrata "Fausto Susatti" on Cima Capi and following the route "Folletti". It is a ring-route on equipped trails easy and very panoramic (is directly above Lake Garda) duration of 5/6 hours. Our fantastic round trip of the day is like a examination for the participants and a fun beginning in alpine environment. The Brenta Group is similar to the more famous Eastern Dolomites (Cortina area) but the rock walls and pillars there are bigger, the environment harder and wilder therefore less touristic and more alpine. Through these multicolor fantastic walls runs the famous track Bocchette del Brenta which is ideal to exercise our courses in the Mountains. Sometimes on the via ferrata Bocchette there are passages which are not equipped with iron cables and we have to do some free rock climbing (easy but mostly quite exposed). Therefore is is necessary to have a good rock climbing technique. Sometimes we must cross snow channels therefore we have to belay with the rope and is useless to have a rope in the backpack, if you have no idea of how to use it. 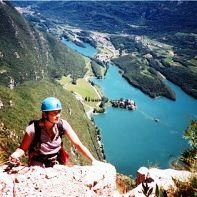 In the advanced Training in the Brenta Group we have the possibility to learn the correct rock climbing, rope and abseiling techniques which are the base to climb in safety every via ferrata in the World. Our base camp is Rifugio Agostini which we chose for its central position between the most beautiful routes in the Brenta Group, very good food, cosy and quiet accommodation, friendly owner. The only disadvantage: it is 5 hrs. walking distance from the last village San Lorenzo in Banale but we have the possibility to shorten the approach to 1,5 hrs. by hiring a jeep (cost 20 EU per person). This course is destined for people who have a little experience in high mountains or for very athletic and adventurous participants. In the afternoon we try our equipment, we practice belaying und learn some knots with the rope and set our crampons in order not to lose time the following days on the difficult routes. 2nd. day - Departure from the Rifugio at 08.30 a.m. to a small rock climbing wall near the Lodge (Ascent 10 min.). Here we practice the rock climbing technique on easy routes with top rope system. The mountain guide belays you from the ground and he can see and correct your rock climbing technique and foot position. We also try abseiling and belaying a partner in case of difficulty. In the afternoon we reach in ca. 30 minutes a small glacier named Vedretta d' Ambiez for learn the correct use of crampons and how you have to belay a partner in a glacier area. In the Brenta Dolomites this would not be necessary but is indispensable in other via ferrata areas (es. Marmolada). The experience of this day is very important for the continuation of our training. 3rd. day - From the mountain lodge we ascent in 45 minutes to the beginning of "Via ferrata Castiglioni". The vertical high ladders improve our body resistance until we reach the Bocchetta dei due denti (1st pass). Downhill we reach the Rifugio XXII Apostoli right in time for lunch and later up to Bocchetta dei camosci (2nd pass). Short descent on the Vedretta dei Camosci where we cross with crampons and later on up on "Sentiero dell' Ideale" following an easy route to the Bocca d' Ambiez (3rd pass - the highest in the Brenta Dolomites). From the Bocca down on the Vedretta d' Ambiez (wear the crampons again) until the Mountain Lodge Agostini. Duration of this fantastic round trip (the best in the Brenta Group) is ca. 6/7 hrs. walk. 4th. day - Starting early from Rifugio Agostini at 7.30 because we have a long day ahead of us. We ascent the with crampons to the Vedretta d' Ambiez to reach the "Via ferrata Brentari" in ca. 45 minutes which is leading us to the gigantic wall of Cima Tosa (the highest Top of the Brenta Group). Downhill towards Rifugio Pedrotti alla Tosa but we are not going to reach it as it would make our daily trip too long. In spite we follow the Sentiero Palmieri towards Rifugio Agostini. We collect our remaining belongings and start our descent through Val d' Ambiez until we reach San Lorenzo in Banale. The duration of entire route can be up to 8 or 9 hrs. In case this should be too much for you, we suggest to spend an additional night in the mountain lodge and descent more comfortable the following day. Often we are receiving special requests from individual guests who would like to attend this course with just 2 people, with only their partner or a friend and without other participants. We are happy to meet the expectations and special requests from people who have specific date requests or certain requirements regarding the treatment. This proposal is also dedicated to people who due to business reasons or certain dates of school holidays are not able to match their needs with our calendar program dates of our activities. During a customized individual lessons our mountain guide is able to transmit profound knowledge and to dedicate completely to your own requirements and capacities. The rate of the course EUR 445,00 per person and does not include accommodation. The participants may choose their own appropriate place to stay which suits them most. The rent of all technical gear such as helmet, harness, carabiner set, rock climbing shoes, rope and carabiner material is included. The program of the individual treatment is the same as the Base courses or Advanced in Brenta. The rate of the advanced training in the Brenta Group on the Bocchette way (4 days) is EUR 675,00 per person.